the stealth capability is too hard to resist. That small amount is F35A or F35B. If it is the B, we won't need more that 40 for the "humanitarian" vessel. What happen's if after testing, they're not suitable? From the statement from government, f35 is the decided choice. I think what they mean by testing is to see how best to integrate the f35s with rest of SAFs system for interoperability. Recall how we bought the F16s and how they were designed to suit our needs..particularly F16D spines. I am interested to find out if we are getting the As or Bs or both. With respect. The F 35 is completely a "nice to have", 'technological marvel" but not a must have. I am sure DSTA put enough though into the various trade offs but at some level the high level strategic thinking was just not present. a. The problem is not the F 35. Its what will happen when we introduce the F35. As it stands out its well documented in Defense literature that our defense improvements drives a response from our neigbours. So we get the F 35 but the neighbours buy the S 4000 from Russia. In a sense our F16 and F15s did not have to worry about a high tech SAM based IADs previously but a F 35 buy will trigger a response which puts 80 percent of our fleet at a risk which it did not have to look at previously. Its a lousy risk benefit trade off. b. Baby Carries and F 35B 's I mean seriously is that a game we should be even playing in as a baby carrier without support is a white elephant as the Thais have proved. Again a nice to have and something we can have but is it a should have or must have. The choice of the variant was decided a while back, F35B. A small number of 8 aircrafts similar in numbers to when we acquire the early F16A/B in the 80s. We need to keep air superiority balance with our neighbours who are introducing SU-35 a 4.5 generation aircraft in the region. We did not confirm the acquisition until our neighbours announce their purchases. The baby carrier angle is definitely suspect. At best a dozen or so planes, how many ships tho be credible? If going for much bigger ship... realistic or not from just manpower point of view let alone regional political effect. With respect the Sukhoi 35 is hardly a 4.5 gen fighter. The characteristics of a 5 gen fighter have been laid out. super cruise, stealth and super manuverability. The SU 35 only qualifies limitedly for one and fully for another ( Super manuverability) hardly a ringing endorsement at most a 4.1 or 4,2. The SU 35 is an upgraded Su 27 and we have upgraded f15 SGs. The Su 35 and F 15s are similar in design and from a similar generation. We already have qualitative , and quantative superiority in the region as an integrated system of systems and not just a pure system alone. IE force multipliers, integration. A baby carrier can probably embark no more than 8 F35Bs. Assuming an optimistic 70% availability, that means 5 or max 6 combat ready aircraft. Assuming 2 baby carriers, these 10 to 12 F35Bs are a still a very credible deterrent which complicates any opposing forces' ability to shut down SAF's very limited number of runways. I believe a fully loaded F35B can take off within less than 1,000 ft of runway. Best then to also invest in turning more roads into F35B runways. Access to these runways preferably via above ground or underground hardened shelters & supporting facilities. Pulau Tekong could also accommodate hardened facilities and runway for F35Bs. Seems a bit odd that the f16vs will be used for 10 or so years. My guess is that the f16s will be gradually withdrawn from service after 2030 similar to the f5 s/t. Hence, we will in effect be similarly be operating 3 types of jets - 40 f15sg, ard 60 to 70 f35 and ard 40 f16v. During the period rsaf retires the remaining f16vs, we could be looking at a 6th generation jet (to replace the f15sg) or more f35s or combination of both. Thank you all for sharing your thoughts on the search for an F-16 replacement. @Locke: Singapore's arms acquisitions do not always trigger a response from the neighbours. Supersonic anti-ship missiles, diesel-electric submarines, rocket artillery are among the weapon platforms that existed in the region before the SAF introduced something similar. The SAF has a capabilities-based approach to force development, not a threat-based approach in the development of a full spectrum of capabilities. I reckon this is worth a blog post to explain more and illustrate with examples - possibly closer to Singapore's budget debate season. Brilliant! Terima kasih on the telur easter for angkatan laut Sg. The question is as always is the "capability " a must have or a "nice to have". An article on the Israeli F 35 in Aviation Week stated that one of the reasons they the Israelis wanted to integrate their own C 3I software on top of the F35 source codes was the prediction that the stealth advantage would only last ten years and they needed the option to mount their own jamming pods. Or to put it another way, we could have the capability to have a baby carrier but should we ? Again its a question of capabilities versus costs versus a nice to have versus what is required to maintain the edge that we already have. I believe in a book on the local defense industry one wise wag stated, we do have the "capability" to design and build our own fighters aircraft but should we is the question and with regards to the F 35 I do not think the question is being asked. Singapore has the ability to build fighters but why should we when its far cheaper to buy them? To design and build a new aircraft is a non-trivial exercise where we start at absolute zero with no experienced aviation design engineers, no CFD or wind tunnels, zero production facilities to make the components for the sub-assemblies to go into the final assembly, zero aviation-grade carbon fibre manufacturing, zero stealth coating/layering production facilities, zero instrumented testing range and zero certified test pilots (for all I know). Is Singapore willing to absorb the cost? Japan did this with their F-2 project as they wanted to create an advanced aviation manufacturing industry and ended up with 94 F-16 derivatives aircraft that cost 4 times as much as an F-16 - so they easily could have 350+ F-16s for the cost of 94 F-2s. 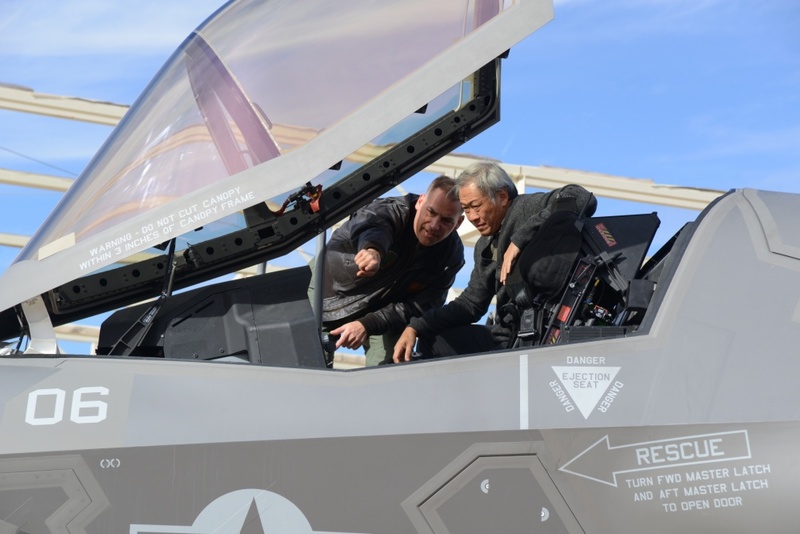 In fact, Japan will close their Nagoya assembly facility after their first batch of F-35s, citing cost concerns, and buy their second batch of over 100 F-35s direct from Lockheed Martin. Baby carrier - this is a different matter as ST Marine already has decades of experience building a variety of naval vessels, from small police patrol boats to 8,000 ton LSTs, and have already conducted two design studies (Endurance 160/Endurance 170) so they should be able to build one or two 20,000 ton ships. However, I do not expect JMMS to be an Endurance derivative - more likely a Juan Carlos, Mistral or Cavour derivative constructed in Singapore as ST Marine doesn't have institutional knowledge on aircraft deck handling, aviation ordinance storage and handling. Set out dates for jmms... baby carrier? The point about my post was whether , we should have the "capability" technically it is within out ability whether " stealth " or a "carrier" , and yes we can afford it, but rather is it a nice to have or a must have ? Soft ware of f35 is unreliable. Can we use F35 body ,but F15__16 control system,ie sensors . Fire control etc ? The software of the F35 is good especially the blk Sg will end up purchasing; and constantly being upgraded. As many have already highlighted a very big unknown is the real world operations & life cycle cost of F35 ownership. Availability is another big question mark. I tend to be in the camp of having the F35 as a "nice to have" for SG. In particular the F35B's key advantages of STOVL for the purposes of aircraft dispersal & stealth as a secondary benefit. But if the costs are so high, I think the money can be put to better use somewhere else to give SG a bigger bang for the buck. Resources for force development will always be limited no matter how much we have. And Locke has a good question on capability that SAF is working on, whether are they "Good" to have or "Need"to have. As mentioned by David, Singapore has a capabilities-based approach rather than a threat-based approach in force development. The idea of this is where and how the technology develop and should our adversary has that capability, do we have a solution? It is not so much about matching or get one step ahead of our potential adversary but to know about the potential and limitation of each new technology or capability and prepare ourselves for any possibility. With the current environment, there is little barrier for transfer/ gaining of technology, plus countries diplomacy is getting volatile. The world is changing fast and getting more uncertain. We need to Expect the Unexpected and be ahead on the relevant (but not all) technology and capability. F35 too rely on touch screen operation on fire control .I think this cause 24 million line software too complicated. How can a pilot touch screen to fire accurately and instantly under a great G environment? f 35 gao report . More like its the networking capability and ability to collect, fuse and hand off large amounts of data. We will probably use it as a penetrating ISR asset. It can survive over enemy airspace unlike a uav and find, fix and hand off the data for other assets to strike. Even if costs become prohibitive, a small fleet of 8 to 12 can be afforded and used as ISR assets. Right now our strategic uavs are vulnerable in a high intensity near peer conflict. The f35 solves that. F35 even in small numbers will allow us to address the stand in ISR problem especially in the initial hours of a high intensity war where air superiority is not 100% won yet given out context intensive surveillance is required against mobile artillery. Conventional UAVs may not be very survivable in those initial hours. The f35 even in small numbers allows us to penetrate hostile airspace, find fix and vector in other platforms to eliminate targets. It is in that context not a good to have but actually solving a difficult problem. Mr Boey mentioned other countries buy two f 35 for testing.they buy 2 just for a show,with due respect. They alread a partner . Do not work well, the planes still can be used to take out enemy sensors with 3700 lbs internal weapons . Two is not enough to maintain combat readiness . Maybe someone can weigh in. I don't seem to see the logic of the forthcoming closure of PLAB. Why not shut down SBAB instead? Its granted marginally less acreage but surely rotary assets can then be split between TBAB and PLAB? Say attack assets at one and assualt/Heavy lift the other? Or are there constrains operating mixed fixed wing and rotary on the same base? Considering during times of conflict escalation, our lack of depth may render us vulnerable to such tactics as employed by Hamas in lobbing cheap rockets to disrupt air operations, surely we need as many runways as possible (including secondary roadways), even with F35B. Call it kiasu. Why then sacrifice PLAB's runway? SBAB is a sizeable base with a much more limited runway that can be given up instead. If anything, I'd also consider shutting down Seletar which is constantly compromise by politics up north. If there is less stress on Changi East to accommodate the loss capacity bc of the added runway in PLAB, then surely private operations at Seletar can be transferred to current redevelopments on the Civilian side of Changi plus maybe Changi West. So why PLAB? Why not SBAB + Seletar for sacrifice instead? Curious. Has this really been as thoroughly thought through?